Spotted by a visitor to the bach this morning (19 February) about 9.00am (have to confess still in bed myself), a large pod of whales and dolphins in Piha bay out beyond the end of Camel Rock. Covering a large area, the creatures appeared as long dark shapes in the water with rounded fins, round blunt headsÂ and occassional spouts or splashs of water. 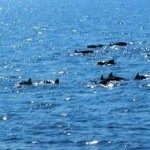 At the front of the pod were dolphins and there were seabirds around them. We estimated about 30 but possibly many more covering a wide area. I reckon more like a 100 or more. What a sight! There was no sign that the surfers in the water had seen them, but that’s not unusual as we are higher and often see things in the water that are not visible from the beach or in the water. Unusually there was noone on Tasman Lookout which would have given a great view. We thought the whales were moving south but very slowly. As the Thundercats were setting up at North Piha we thought some care needed to be taken so we rang up the Auckland Council who at first said they did not know about the event. Next we rang 0800 SeeOrca who thought from our description that it was either Pilot Whales or Pseudo Orca. They informed us that these whales were often accompanied by dolphins. See Orca advised us to ring the Department of Conservation who said they would ring their regional person and get someone out into the water. Next Auckland Council rang back they already had a ranger ready to go out on the water to check it out. 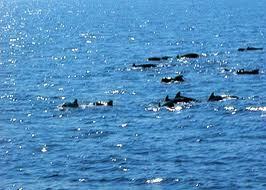 DOC rang back – told them not to worry, Council was onto it and we thought the whales were moving South. Having had a good look online at descriptions of whales we reckon they were most likely Pilot Whales which according to the experts are not acrobatic, move slowly often in big pods, and tend to “log” in the water. That’s how they looked to us. We were most impressed at how quickly the various agencies got onto this, but it did underline that spaces given up to noisy motorised boats are also shared by wild creatures who provide much more of an awe-inspiring spectacle any day.